Injured and need guidance now? How do I select the right attorney? Pulling readers into the courtroom, Indiana trial attorney David W. Holub takes you in the trenches with him on an entertaining and enlightening journey that offers readers of his new book a glimpse of the legal process and what it takes to win at trial. David peppers each chapter with stories, anecdotes and lessons that make the courtroom come alive and give readers deeper insight into what is involved in preparing and taking a case before a jury. How a decimal point data entry mistake led to the collapse of bridge that destroyed a number of lives and disrupted the lives of their family members. The casual link between a crash on the expressway and a man’s death while jogging. A case that involved a trucking company that put a dangerous trucker behind the wheel of an 18 wheeler. The baffling appearance of a disease not encountered for years. Setting a legal precedent that encourages manufacturers to set child safety as a priority. How a seemingly inconsequential hospital error lead to the death of a patient. How an amusement ride operator’s failure to follow critical safe operating procedures put county fair patrons’ safety at risk. Why the defense team searches every corner of the internet trying to find things out about an injury victim. Why honesty is the best policy. How a trial is like a Shakespeare play or a Rogers and Hammerstein musical. Selecting the right trial attorney can seem like a frustrating and daunting task, especially for someone who is injured and in pain. In today’s fast-paced world, information, as well as misinformation, abound. The last thing most injured people feel like doing is sifting through truths, half-truths, and lies in order to find the right attorney. What most people really want is an attorney who is trustworthy, empathetic, and hardworking. People need to feel confident in their attorney, knowing that the attorney is willing to do the heavy lifting needed to make a financial recovery and has the experience and track record as an advocate to go the distance for clients. 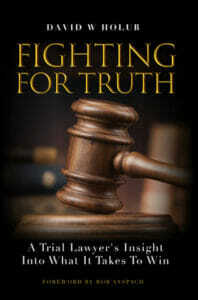 By helping people understand what a trial lawyer does and how cases are won at trial, this book helps people discover the skills and qualities to look for in selecting a trial lawyer who will relentlessly fight for truth on behalf of clients. Available on Amazon in print and kindle. Fill out this form for a fast and FREE case consultation. Copyrights © 2019 Law Offices of David Holub All rights reserved. Copyrights © 2019 Law Offices of David Holub. All rights reserved. Disclaimer: This website contains Advertising Material. The website owner is not rendering legal or professional advice and assumes no liability in connection with its use. Information contained in or linked to this website regarding past litigation results must NOT be considered predictive of future success. For the methodology used to confer a noted award or accolade, please go to the website of the issuing organization. Awards and accolades using a superlative (e.g. super or best) are not meant to imply that attribute, but rather to convey the name of the issuing organization. No court has approved any aspect of any advertisement on this website or linked pages. E-mail, chats or info requests may not be secure. Outbound links are for convenience and we do not endorse and are not responsible for linked content. We disclaim liability for any damage resulting from a virus or malware acquired via this website or a link.